Use Unverified flag to mark translation as the one that is not considered 100% correct. Unverified flag is used to mark a translation that you do not consider 100% correct. You can mark it with the help of the Unverified button found at the end of the translation row and come back to it later in your process. Contributors may filter just Unverified strings to see which translations need corrections. 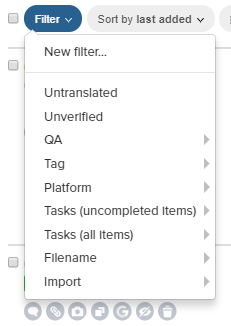 There is Auto-toggle Unverified option in project settings, that would automatically mark other language translations as Unverified in case base language translation has been changed (within the editor, at import, over API or using any other source).